French Achiever screw presses offer outstanding features and reliability for full pressing to produce full press cake and crude oil from a wide variety of oil bearing seeds. Available in multiple sizes, depending on your processing capacity, the Achiever press yields high quality oil and cake with residual oils among the lowest in the industry when using the single pressing process. The Achiever screw presses can also be supplied for prepressing oilseeds to produce prepress cake prior to solvent extraction. Contact a French representative for a quote or for more information about French screw presses. Instantly download our free brochure literature on screw presses. French is the only company with a screw press designed to water-cool its main cages in addition to cooling the main shaft. When full pressing, this benefit reduces the temperature rise, reducing heat degradation of the press cake and crude oil, giving our customers a lighter color cake and higher quality oil. 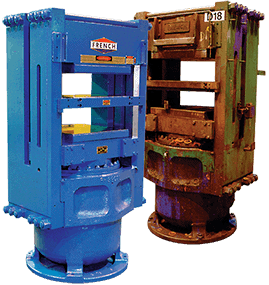 Our heavy duty, rugged oil extraction screw presses are designed for many years of dependable service. Presses can have a life span over 50 years when properly maintained. The Achiever is available with either a motorized cone mechanism at the press discharge to allow full control of backpressure adjustment while producing press cake or a die plate to produce porous pellets prior to the solvent extraction process. 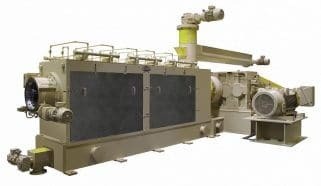 The screw presses include an efficient force feeder assembly to expel air from the feed stream and insure 100% feed to the feed hopper and main cage. The force feeder includes a vertical fixed speed screw conveyor and a variable speed horizontal feed conveyor to convey the material from the conditioner discharge to the press force feeder. Hardcoated shaft parts and screen bars last two to three times longer than case-hardened parts. Screw Presses include a parallel shaft helical gear reducer. Reducer has splash lubrication, a service factor of 1.75 or greater. While you are evaluating your equipment options, partner with French’s team of experienced processors by conducting trials on your feedstock in our Innovation Center. Through these performance trials, our engineers can recommend custom French equipment with unique screen bar designs and shaft arrangements that will give you maximum productivity and operating efficiencies. Please contact our Oilseed Group for more information or to request a quote for French Achiever Screw Presses. French also offers the Model L-250 Laboratory Screw Press. If you are already the owner of a French screw press, contact our our Aftermarket Sales department to order parts for the D-88 dual cage screw press or for the following models: F-33, F-44, F-66, F-88, D-66, D-77, B-1500, B-2100, B-3100, F-1025, C-3300 and H2-6600.